Looking for ideas for jungle party decorations? Inflatable zebras, giraffe beach balls, and monkeys swinging from the vine will get your guests ready for a safari. We made these bright yellow and orange lions and giraffes out of paper plates. The kids painted them yellow and glued on the faces that were actually from a craft kit. Paint the dowels yellow and add orange and yellow streamers. Jungle party decorating can be inexpensive if you use a little imagination. Not only are these jungle party themed animals used for decorating we used them for the jungle parade when the kids arrive. Each child picked their favorite animal for a jungle dance around the pool to jungle music. 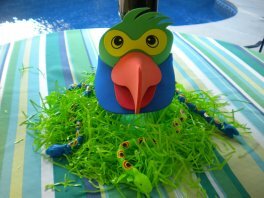 This colorful parrot sits atop a bright colored tablecloth with some slithery snakes hiding in the green grass. The parrot mask was purchased at our local dollar store. 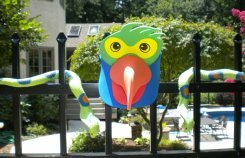 Hang a parrot or monkey mask/visor onto the pool gate with some colorful rubber rainforest snakes hanging from the sides. 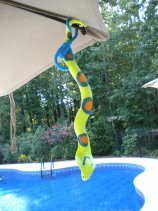 Colorful snakes hang from the umbrella ribs and of course later end up in the pool. Using chalk draw elephant or lion prints on the sidewalk to the pool or even starting in the driveway. 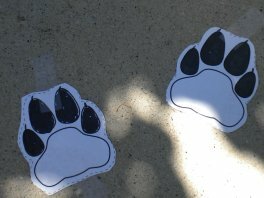 You can also cut out paw prints from sheets of colored foam and place them on the sidewalk as a lead into the first game, a Lion Hunt. I found a template for these lion foot prints on line and printed out several copies. Then tape them on the sidewalk entrance to your pool or front door. The kids loved following the paw prints into the pool entrance and when they left they stepped on each paw print - trying not to touch the cement. Kids can make anything into a game! 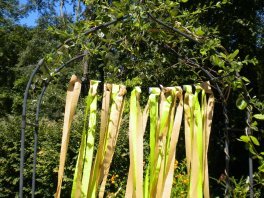 Drape brown and lime green crepe paper at the door entrance or in our case, the arbor is the entrance to our back yard pool area. First cut some clear string and tie it across the arbor. Then cut the crepe paper long enough so it almost touches the ground. As you can see from the picture I loosely tied one strand of brown and one strand of green crepe paper together. Large and tall is good for decorating outdoors - especially when it's a giraffe! This inflatable animal is 3 feet tall and stands on it's own. Let him greet your guests at the pool entrance or by the party table. Use him for a great photo op as well. Lightweight he can be moved anywhere. He has a "real" animal look so use him to decorate for any age group. I love these jungle animal inflatables - it's a set of twelve with two each of monkeys, tigers, lions, giraffes, elephants and zebras. 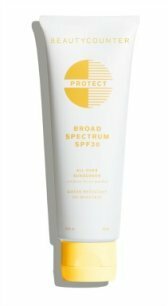 Set them out by the entrance to the pool, on the party table, or along the pool deck. 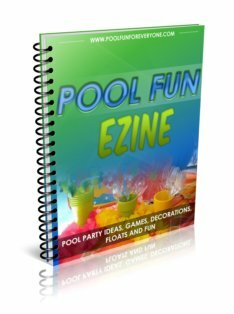 Inflatables make for great pool party decorations - it doesn't matter if they get wet and kids love playing with them in the swimming pool. Let the kids bring home their favorite animal as one of the party favors. 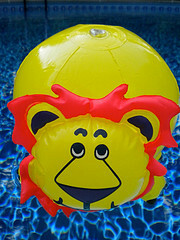 We purchased a set of twelve Jungle Animal Shaped Beach Balls and had them blown up and floating in the pool when the guests arrived. 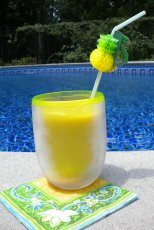 We used these fun beach balls for decorations, games and as take home party favors. 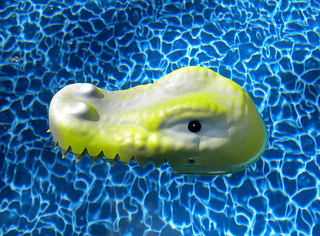 This very real crocodile was found floating in the pool when the guests arrived at the Jungle Pool Party. Scary! Use the masks for a pool party game as well. Have an adult wear the mask and chase the guests. Any one who gets tagged is "frozen." Find them at your local dollar store. 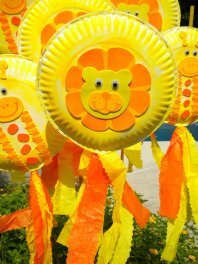 Balloons are an inexpensive way to decorate - especially with these zebra, lion and tiger printed balloons. There are 12 in this pack and they go for a little over $6.00. Take them to your local Hallmark or grocery store and pay to have them filled with helium. Our Hallmark charges .50 per balloon. Place this backdrop on the fence either by the food table or by itself for photo ops. It's about 4' tall by 30' - so it is really long. You can cut it so that it can be placed at different places or use the extra length for a great tablecloth.